On the advice of Qoppa999, I make this dedicated post. … Are They White or Red? I'll start with the points addressed in my critique of a New York Times video report on the visual evidence they pretended supports government guilt. 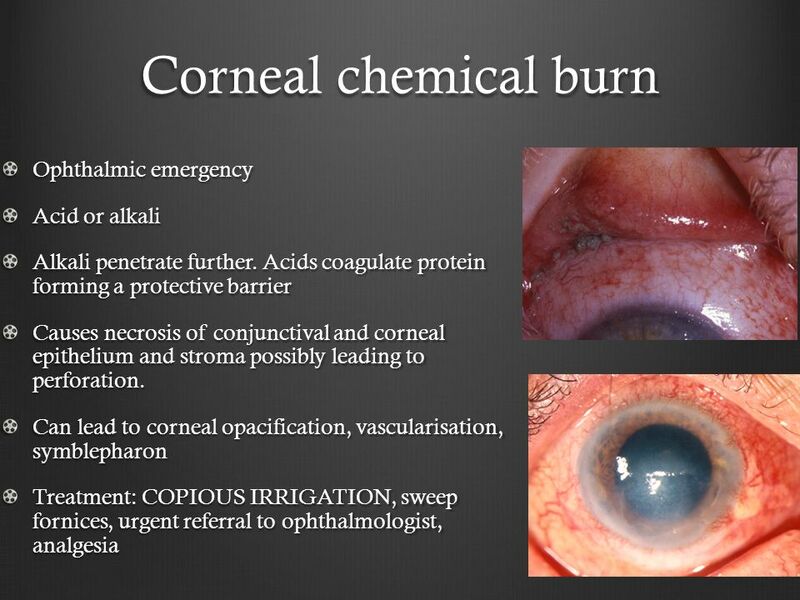 … Another supposed expert (Jennifer Knaack) thinks chlorine causes corneal burns that make the eyes appear white? What a moron. 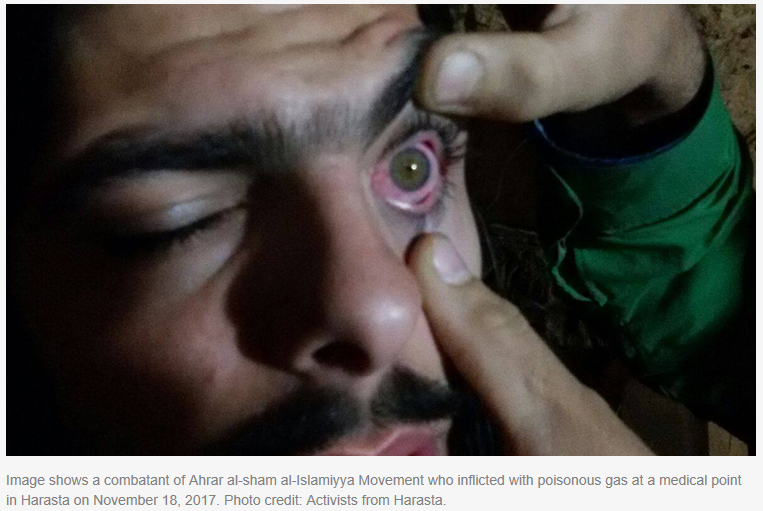 The literature has been pretty clear for over a century, but a bit more mixed the last few years in Syria; the acid created when chlorine contacts the water in the eyes causes a mild to severe redness in the eyes. In more severe cases, from what I know, they'll start melting, get really red and pour blood. The point where the whites are still white is at little or no exposure, not at severe exposure like they heard. Whiteness over the whites is generally the point the Douma victims are at. The added whiteness over the pupils she seems to be referring to, I think, is a simple phenomenon they call "clouding." It's a basic thing that happens to all dead people and animals, like rigor mortis. This eye claim has previously been made by supposed chemical expert Keith Ward. 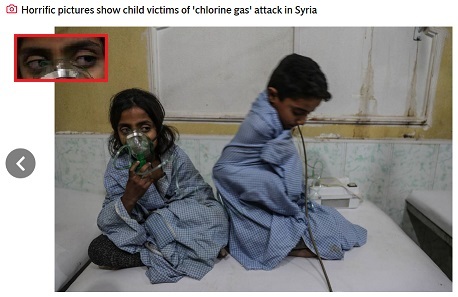 In an article run by Bellingcat, he decided "the vast majority of the clinical signs and symptoms (such as the corneal opacification...)" are, of all chemicals around, "most consistent with exposure to high levels of chlorine, although they do not completely rule out that a nerve agent might have also been involved." What a moron. He clarifies they refer to clouding, and are unaware this is just a sign of death. … He's also cited in the NYT repot at 9:24, testifying to the frothy mucous clue, but not the eyes. Instead, Knaack is brought on to address that. Did Ward decide to drop that point, forcing them to find someone less qualified to repeat what they had heard around … from the likes of Mr. Ward? 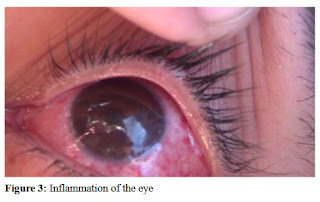 This BBC article takes reports from locals of "corneal burns" and/or "cornea irritation" as signs of chlorine, seen/reported on patients and those found in the home - who only display clouding, which should NOT be seen on living patients. No deaths from mechanical injuries were visible. All of these symptoms are characteristic of a chemical weapons attack, particularly choking agents and organophosphorus agents or hydrocyanic acid (the solution of hydrogen cyanide in water). * this image search for cornea irritation shows what I'm saying: this means red eyes, not ones that are cloudy as if one were dead. 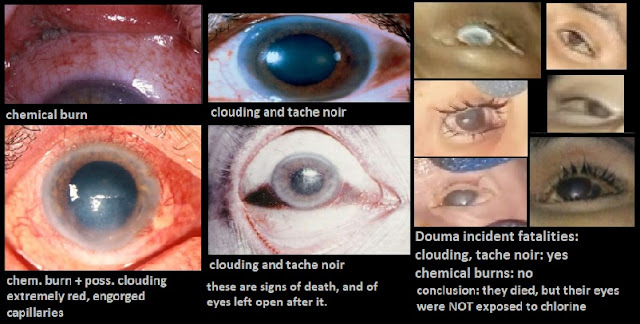 * here's one easily found online explanation of post mortem eye clouding. * Here's another list of the basic signs of death, one of which is "Clouding of the cornea." Explained: "The transparent window of the eye begins to cloud quickly after death." Some images show an additional red-black band across the white of the eye I've rarely seen or noted. Digging around, it seems they call this tache noir (black spot): if the eyes are left open after death, I guess from not blinking/moving and moistening like usual, the exposed part darkens that way (in the dark or only in the sun or light?). This may be the cause of the dark spots on the eyes of the boy whose left eye is shown below (small, in the lower right corner). That also is not a chlorine burn. 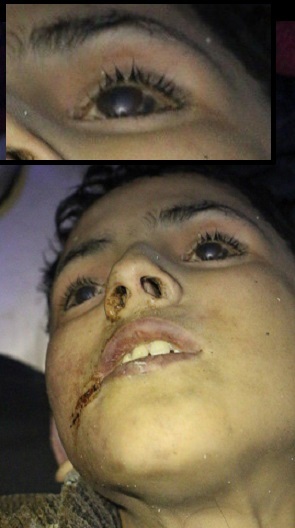 There are injuries to the eye that cause scarring that appears opaque like the Douma victims and all other dead people. Glaucoma causes similar. I've seen cloudy-eyed people blinded by chemical release in Bhopal in the early 1980s. But that, I believe, is scar issue that appears after the initial injury has healed. But dead people don't heal. What the injury looks like, before and shortly after a related death: bloodshot red, like after the swimming pool but worse in a severe (deadly) case. Chlorine causes acids, which burn less severely than an alkaline would (per this graphic and other sources), but enough to show up visually like the eyes on the left here. 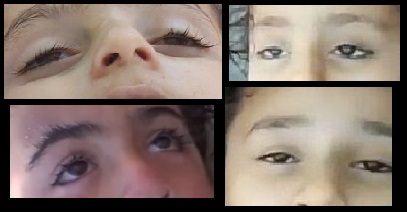 Compare this to eyes that simply show death (middle row) and then to the Douma victims (6 samples, and they're representative). 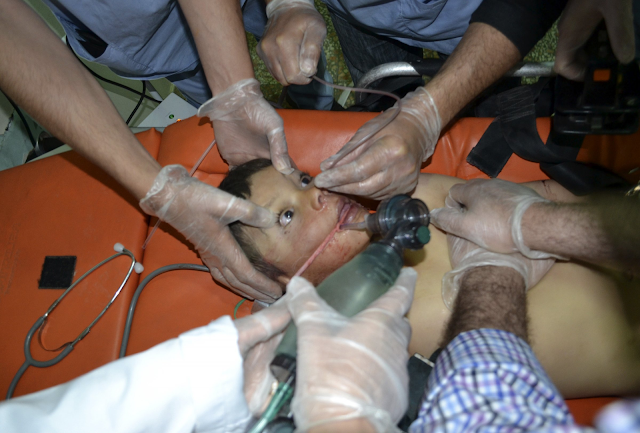 April 21 2014, Telmines - a boy who eventually died, white eyes being rinsed for good measure, but blood in the airways (filling the suction tube with pink foam, also across his cheek - that comes up in Douma, 2018 as well. Hm. yellowish color? Also, Dr. Tennari is not present in these scenes, when he claims he was. He first described the victims as strangers or displaced people rom another town, then decided they were family friends he had recently visited. Came as a real chemical attack by Islamists hit Aleppo's Old City, killing several, including soldiers and civilians. (barely noted or ignored in the MSM reports hyping the opposition-claimed attack on this day). Aug. 10 and 11: some of the many children with no engorged capillaries in the whites of their eyes, but allegedly exposed to chlorine released by the nefarious regime. You cane tell by the costume (oxygen mask). Three of the many white-eyed children filmed at a clinic that same day, treated for the horrible chlorine exposure from that same attack, or perhaps a nearby one with even less factual basis. At right is, apparently, one of the two fatalities of the Sept. 6 attack. That's a good guess, but either way, he's in an extra bad state after the chlorine attack he's shown as a victim of, not breathing anymore, and staring blankly. It ripped up his lungs, but none of it got in his eyes? Abdallah Mahmoud, an administrator working in the al-Quds hospital, said that the hospital treated 47 injured civilians. Their symptoms included red eyes, difficulty speaking and breathing, and coughing. Habit, April 3, 2017: (just hours before the Khan Sheikhoun alleged sarin attack, chlorine reportedly dropped on nearby Habit village. 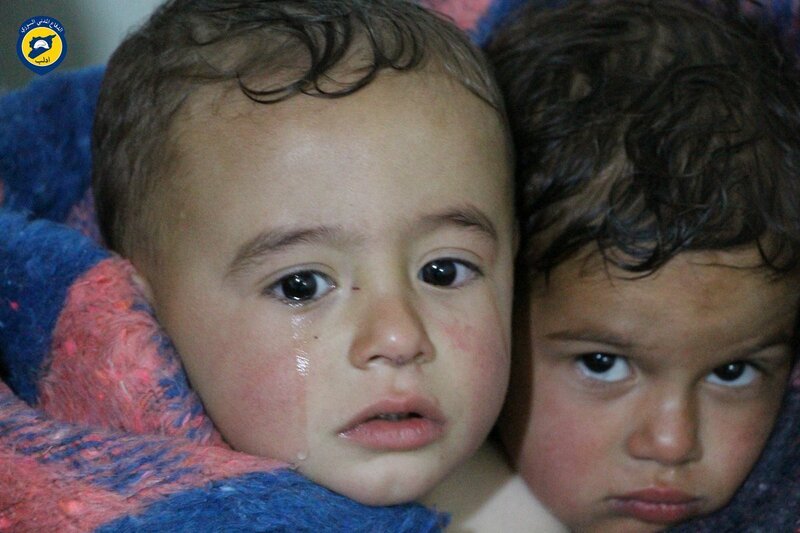 Three strangely "displaced" children photographed after surviving the chlorine attack - just now washed down, and already any eye redness they had has disappeared entirely. One has watering eyes, but that must be from sadness. It seems a newborn/unborn brother of these kids, and maybe his/their mother, died in the chlorine attack, but they weren't reported that way at the time. Their fathers - two brothers of disputed/unclear name - had already died, allegedly from Russian bombing while they were working on a hospital in Latamnah, and not as slave labor. On Monday 30/01/2017 at 4:00pm Damascus time, The emergency department of Al Marj received injured civilians as a result of a poisoned gas attack (probably chlorine gas). 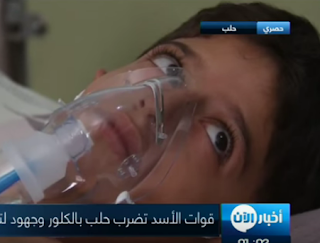 The injured who came to the hospital said that the exploded bombs contained green gas with a very bad smell. On Feb 9th 2017 in the morning, we received several cases that had the following symptoms: eruption, absence of consciousness, vomiting and irritation in the eye. These symptoms are the result of the chlorine gas exposure. "We don’t know if it’s the chlorine gas or another one. " "...we, my family and I, started to inhale a strong and strange smell, following which I blacked out, and fainted." “The injured who were taken to medical points had a chlorine-like odor, they suffered from dyspnea and the irritation of bronchus and conjunctiva (eyes)." Kids shown in masks - one set of eyes that might be faintly pink. "There was a child among the injured whom we couldn’t save because he was in the centre of the targeted area the time of the attack … we initially suspected to have involved chlorine, as the child’s features and face indicate that he was suffocated..." The first boy who died, just the all white eyes (probably clouded too, but hard to tell from this view). Douma Coordinating on Facebook. The small scrapes on his nose are explained as part of some unrelated wounds from falling debris, which isn't what killed him. But then they decided this wasn't chlorine, just some confusion. Here's one story as to why they changed tune halfway through. Note also closeness in time to the Skripal poisoning in Salisbury. 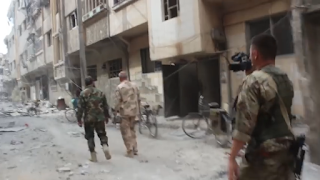 Something went wrong, and they tried again a month later in Douma. Pure, military-grade sarin is free of smell and color and caustic properties, but in Syria, a dirty kind is used that's yellow, smells foul, and like chlorine, burns the eyes and airways - this is grounds for some confusion, and other grounds have appeared, causing lots of confusion. Anyway, we should see about the same as for red eyes, and we do - a mix of possible exposure and probable non-exposure, but oddly with more realistic red seen than in the chlorine cases where people realize it should appear. 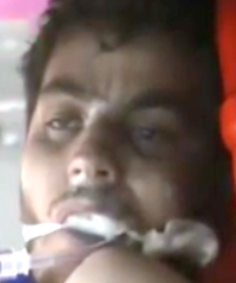 12-22-2012, Daraya: a yellow gas is reportedly released on SAA soldiers, causing 7 to die in short order. 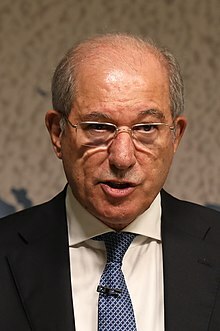 Never clarified, but likely first dirty sarin attack of the war. Eye situation unknown. None of the people seen as victims on video seem to have red eyes or bleeding noses, and they aren't vomiting. Are they stand-ins? This guy - not the best frame, but I recall his eyes seemed fine and white, no better faked than the shaving cream "foaming from the mouth" special effects. (white eyes, on this and another guy: Qoppa999) 2 women and 2 children reportedly died. Then later they noted 9 men also died, including one already on record as a survivor, and one of their wives. Islamists had just conquered the Kurdish-majority district. One of the female victims apparently had her feet lashed and beaten by the nerve agent. That Aleppo attack was allegedly delivered by grenade, dropped from a helicopter - same grenade blamed two weeks later in Saraqeb, killing Maryam Khatib. This allegedly her dilated pupil, surrounded by a sea of almost pristine white. 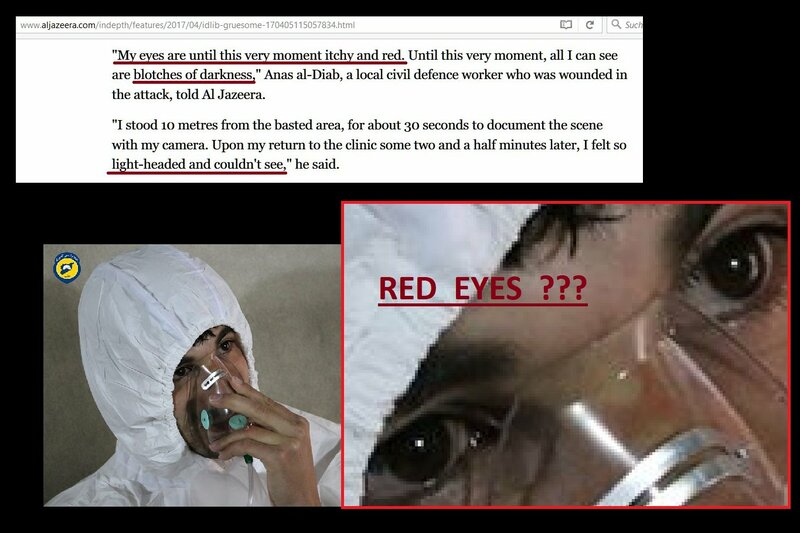 March 30, 2017, Latamnah: "They were trembling, had extreme difficulty breathing, redness in their eyes..."
Many report seeing this fog, some kind of fog appears suddenly on video shot just after the allged jet attack. It's said to smell strange and foul, like sarin does here. Eye redness isn't mentioned much or at all, just the feeling (stinging/burning). As it happens, few if any red eyes are seen among those filmed dead and dying. But there may well have been a low-level release of something similar, by way of a special effect. A surviving victim with miosis, no redness from chemical exposure, no profuse tears like you'd expect with sarin. 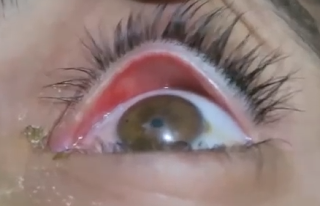 Bright light involved, likely cause of constricted pupil. 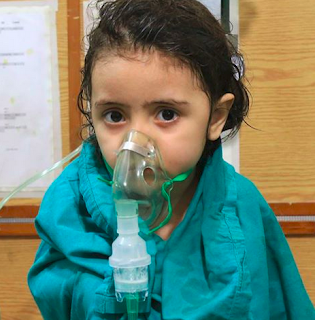 Shown to us by Shajul Islam, an active force in blurring the lines between chlorine and sarin attacks, and a spirited advocate of kidnapping and such in the name of an Islamic State, but not very smart when it comes to medical issues. 3 dead children and one seen gasping, likely to die - somehow, exposed to something, but no sign of anything stinging their white eyes. Mainly they display little to no symptoms, as if suffocated, or killed with a gas that leaves no outward sign. Someone else in Khan Sheikhoun with no outward signs, White Helmets media activist Anas Al-Diab. But he never died, and got a chance to tell his story, unlike those kids whom he and others spoke for. Here he is as seen just after his horrible exposure, and as he describes himself even longer after it. (credit Qoppa999). So, some of what he says on the victims' behalf is untrue, and this is just regarding his own eyes. 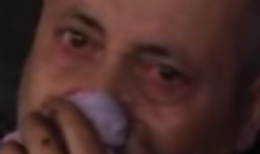 blurred vision, unconsciousness, contracted pupils, shortness of breath, nasal secretions, vomiting, and headaches. 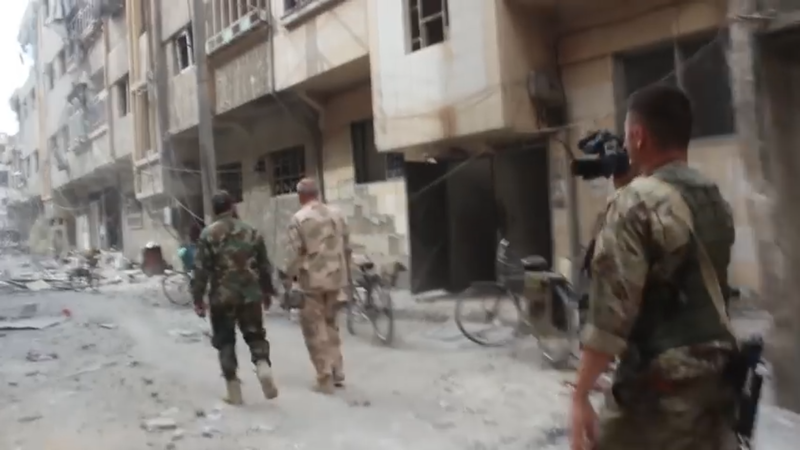 "a small dose of chemical agent was released on the Harasta frontline." There had been chlorine attacks reported in the preceding days. "At first, we thought chlorine is the gas used in the attack," two medics told them, based apparently on eye irritation and breathing problems and the precedent, with no one mentioning a chlorine-like smell. They were discharged as ok but several hours later, about 15 injured came back with the same symptoms. The Syria Civil Defence said that barrel bombs containing chlorine gas had been dropped by helicopter and caused the casualties to gasp desperately for air, suffer severe irritation to their skin and eyes, vomit and collapse. ... a medic said "They couldn’t breathe, they were coughing non-stop, they had red eyes and some were vomiting severely"
Note: vomiting can occur with chlorine, but it's secondary, from too much coughing-retching. The actual nausea feeling plus widespread vomiting is more consistent with sarin, where it's one of the core symptoms (part of the SLUDGE-M syndrome). They should also have diarrhea, drooling, etc. (if genuine), but not all of that might be evident or get mentioned.